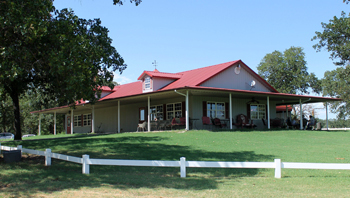 The Henryetta Golf Course boasts a 4,000 square foot club house. Built in 2008, the club house prominently overlooks the course with a covered veranda and patio offering visitors and golfers alike a perfect place to relax and visit or watch others play. Inside there is a dining area that provides a great place to recap the day's game or sit and watch professional golfers compete on the big screen tv. 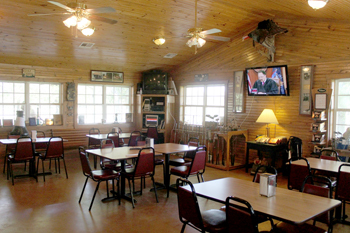 A grill and snack bar is available for those who worked up an appetite after their round of golf. 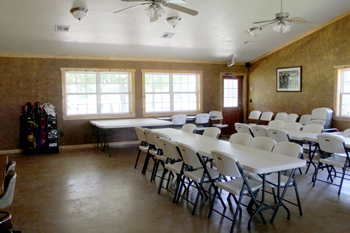 The club house also features a meeting room that gives members a place to gather or host a special function. It is available to rent by the general public for reunions, receptions or weddings. Rental rates for the facility are discounted for members and include a security deposit. Check with the Clubhouse Manager for scheduling availability.